In 1972, a group of hard working dedicated Polish volunteers turned the soil on a beautiful piece of land as the first step in fulfilling their dream of a Polish Care Facility for their seniors. Kopernik originally operated as a private room and board facility, providing shelter to over 100 residents. In 1978, Kopernik Lodge opted into British Columbia’s Ministry of Health Continuing Care Program and registered under the Societies Act of British Columbia so that its residents could benefit from the services available to all British Columbians. Although Kopernik Lodge was built by and serves the Polish Community, it is also the facility of choice for persons of Middle European and Slavic extraction and of Catholic faith. Even so, it is open to – and welcomes all – British Columbians who meet the criteria set out by Continuing Care. Our staff language skills encompass 23 different languages, in addition to English, reflecting not only our diverse set of residents by also that of the Canadian multi-cultural mosaic. Over the years, with funding from the Ministry of Health, as well as the generosity of the Polish Community, the facility has undergone many changes including physical renovations and staff training, to meet the changing needs of its population. This has included an 18-bed Special Care Unit and private pay beds, amongst others. 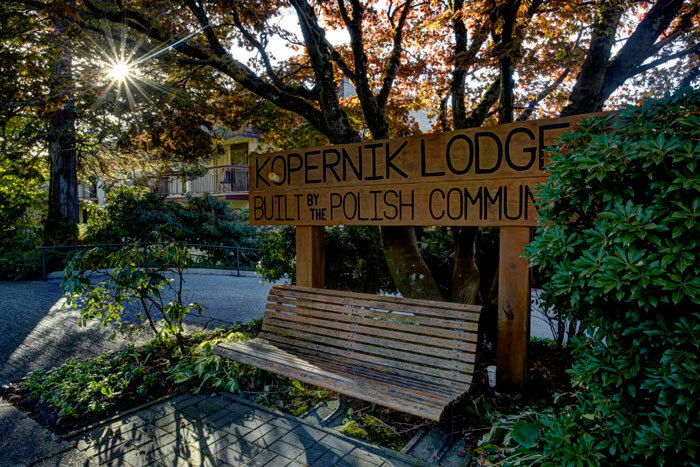 Today, the Kopernik Lodge is an 87 bed, two-story Complex Care facility owned and operated by the M. Kopernik (Nicolaus Copernicus) Foundation, a non-profit Society of the Vancouver Polish Community. Since we began, Kopernik has welcomed over 900 residents from all corners of the world, of all races and faiths, and we remain committed to treat each one with the utmost respect and dignity.